Πατήστε τη φωτογραφία και δείτε όλες τις φωτογραφίες του Golden Leaf Hotel. Visa, Euro/Mastercard, UnionPay debit card, Diners Club. 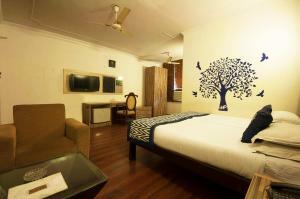 Located 5 km from Qutub Minar, Golden Leaf Hotel features accommodation with free WiFi in New Delhi. Located around 5 km from Rashtrapati Bhavan, the guest house is also 6 km away from Humayun's Tomb. The accommodation offers a 24-hour front desk. Guest rooms at the guest house come with a TV and a kitchen. All units will provide guests with a fridge. An Asian breakfast is available daily at Golden Leaf Hotel. India Gate is 6 km from the accommodation. Delhi International Airport is 10 km away.